You have purchased fresh-roasted coffee, stored it properly, and ground it just before brewing. You made sure to grind it properly for your particular espresso machine, tamped it properly into the portafilter basket, and used all of the proper espresso technical specifications. during brewing including brewing temperature and extraction time. Now the freshly brewed espresso shot sits in the glass and can be observed. The premium gourmet espresso shot should reveal three distinct layers. Sitting on top of the espresso shot in a thin layer is the thin, golden-brown to brownish-red layer called the crema. This foamy layer atop the fine espresso shot holds the finest tastes and aromatic qualities of the espresso shot. The composition of the crema includes proteins and sugars as well as vegetable oils. During the process of pulling the espresso shot the coffee beans’ finest oils are extracted, and when this process is complete you will see a whitish ring begin to form atop the crema. Make sure to stop the extraction process once you see the whitish material as it is bitter and will taint the shot. Beneath the crema and above the heart of the espresso shot is the body of the shot. This is the middle layer and should be a caramel brown color. Beneath the body of the espresso shot is the heart of the espresso, at the bottom of the shot. The color of the heart should be a deep, rich brown. Within the heart of the espresso shot are the shot’s bitter qualities which balance out the sweetness of the crema and the espresso’s aroma. A Note About Espresso Consistency: The high pressure that is used during the espresso extraction process results in an excellent concentration of flavors. This means that the espresso shot works well for blending into specialty espresso drinks such as cappuccinos and lattes without loss of flavor due to dilution. When you are pulling an espresso shot make sure to follow the proper technical specifications. Also follow our tips for steaming and frothing milk. 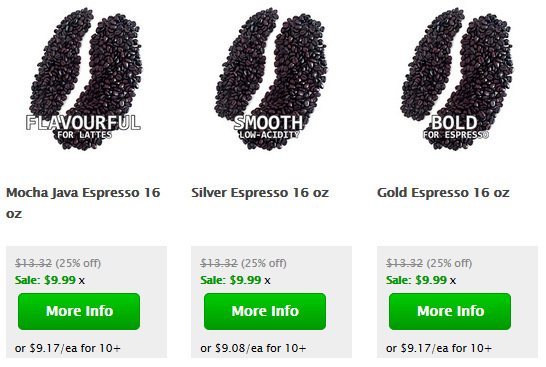 The first step in exploring the wonderful world of espresso is purchasing your Espresso Beans. The process of Espresso Brewing involves the proper method of Grinding Coffee for Espresso and also Tamping the Espresso in the portafilter of the espresso machine. Once you have learned how to pull a shot properly then you are ready to try out all the traditional Espresso Drink Recipes as well as some innovative new recipes that will have you licking your lips! To help ensure a great espresso drink we also provide detailed instructions on Steaming and Frothing Milk since this is crucial to a high quality espresso drink. You can enjoy espresso using all of the world’s finest gourmet coffees from Tanzania Peaberry to Ethiopian Harrar Longberry to Jamaica Blue Mountain and Guatemala Antigua and so many more premium coffees. Check out their flavor profiles in the Espresso Coffee Guide. You can also make espresso using Shade-Grown Coffees, Fair Trade Coffees, Organic Coffees and Bird Friendly Coffees. This section explores the world of Espresso Coffee from Espresso Beans to Espresso Brewing. This includes Grinding Coffee for Espresso as well as Tamping the Espresso. We teach you how to create the perfect Espresso Crema which contains the concentrated essence of the shot, and we make sure you know how to achieve all of the proper Technical Specifications necessary as you strive to Pull a Perfect Espresso Shot. For definitions of coffee terms see our Coffee and Espresso Glossary and read about the intriguing history of the revered bean in the World’s Best History of Coffee.